If you encounter any issues while installing Learning Lodge NavigatorR, you can find helpful tips and solutions in this tutorial. Click to find out more! Firmware updates will periodically be available to improve the performance of your InnoTab® 2S. These firmware updates can only be completed on InnoTab® 2S by connecting the tablet to your computer with the USB cable and launching Learning Lodge Navigator®. This tutorial will take you through the process step by step. Cut the cables and enjoy secure Wi-Fi app downloads with InnoTab® 2S. This video tutorial will show you how you can easily set up your own InnoTab® 2S Wi-Fi connection. Don’t forget that before you can use this feature, you first have to register your InnoTab® 2S on Learning Lodge Navigator®. This video shows you how quick and easy it is to use the Learning Lodge Navigator® InnoTab® 2S home page to access the Download Center to purchase apps; use the File Manager to transfer your photos, music, and more to your tablet, update your tablet’s desktop themes; or update your InnoTab® 2S firmware. Watch to find out more! 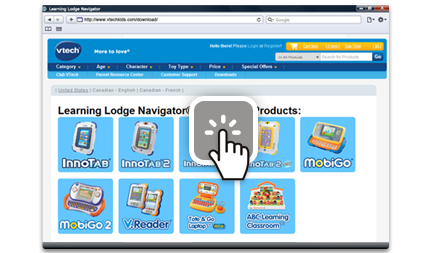 The Learning Lodge Navigator® is the download manager that can be used to purchase and download learning apps or manage files for all of your favorite VTech® Learning Lodge Navigator® connected toys.